Read any biography of anybody who ever did anything interesting and you’ll find someone who mapped out their aims, set out their goals, and made their to do lists – and then got doing. And not just hard-nosed but a bit boring businessmen, either. I came across this schedule years ago and saved it, and I never again told myself that a free spirit just creates, spontaneously, without thought or planning. If you’re Mozart, Shakespeare, or Einstein then you can get by without a plan. If you’re not, make one and regularly review it. 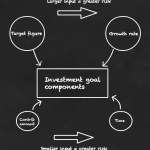 Athletes and entrepreneurs, investors and A-Level students – all can and do benefit from setting goals. Goals may seem boring, but they can make everything more fun. That’s because goals can be broken down into mini-goals, and achieving those can bring their own rewards – even while the main goal remains as distant as Mars to Elon Musk. If you’ve ever walked in the mountains, you’ll know that climbing a foothill only to see you’ve still so far to climb to the summit isn’t always exasperating – often it’s invigorating. It’s the same with anything. Break it down, break it down, and then fill your To Do list with ticked off achievements. When I started Monevator a decade ago, my first financial goal for the site was to make £1 in a day. It took much longer than I thought it would. I made my first £1 in a day when I was away in Romania, of all places. I was on the point of giving up writing a website that nobody read. That was six or seven years ago. I hit my mini-goal, smiled, and carried on. Of course, goals aren’t everything, either, and it’s okay to miss them for good reason, and for your priorities to change. Just so long as you do so consciously, I think. Who cares if you never ticked the Statue of Liberty off your New York list because you were too busy romancing your lover in Central Park? Monevator has been a long tale of under-achievement. It grew far more slowly than my other ventures, the money has always taken longer than I expected, and then some of the money actually went away again. To be honest I thought by now it’d either be an optional full-time job or else I’d have dumped it for something else. But after years of working away at something, you discover stuff you never suspected. You may achieve things you didn’t even think of. Working closely with my co-blogger The Accumulator – who wasn’t around at the start – was not a goal when I began this website. But it has been a highlight. Also, I’ve never created anything that gets as much positive feedback as Monevator, whether via email or in comments here on the site or from certain friends in real-life. I didn’t have “receive emails every week from multiple people who tell you that Monevator is what has turned them into investors” as a goal from day one. Perhaps I should have? It’s been the best thing about the blog, as it’s turned out. But the targets I did have – articles twice a week, links on Saturdays, and only write substantial posts – kept Monevator going for long enough to discover these other rewards. My Achilles Heel is regularly revisiting goals once I’ve set them – and especially with using visualization to help persuade them into being. I believe regular visualization is an important part of using goals, however daft and New Age you feel when doing it. Unfortunately I often feel so daft that I don’t do it at all. I think that shows in some of my weaker results, compared to other goals that have more easily come alive in my imagination. Creating tangible touchstones and then keeping in touch with them – that’s the real power of goals. I don’t believe there’s an unseen force in the universe that conspires to give you everything you wish for if only you’d ask, as certain books allege. But I do believe that if you concentrate regularly on something, it focuses your talents and your mind on that thing. You flake out less often. You spot opportunities you otherwise might have missed. And other people will call you lucky. Negative imagery and mental beliefs are at least as potent, too. Recently I’ve been wondering if the reason I’ve never bought that house in London is because I kept imagining myself not buying a house in London? My self-image is of a canny investor who battles the market and bags bargains. 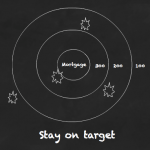 That fanciful image and the London property market don’t mix – or at least not on my budget! Perhaps if you’re a property mogul things are different. Ironically though, I wasn’t ever really thinking of my potential London house purchase as an investment, although I do absolutely believe that’s what homes are. The point is I might at least have bought a two-bed flat in Crouch End. 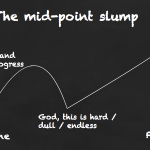 Visualizing goals sounds like a First World problem. Not legal tender, even in Bolivia. 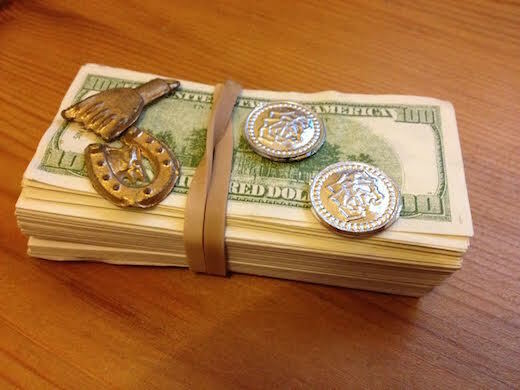 As I’m sure you can tell, it is of course a bundle of miniature $100 bills, with some sort of lucky charms attached, all wrapped up with a rubber band. Ahem. Just what I’ve always wanted? Well, said my friend, perhaps it is. That, my friends, is a genuine Shaman. I’ve even seen a video where he blesses my money with some sort of smoky incense before squeezing something out of a detergent bottle over it. Possibly detergent. Hopefully detergent. 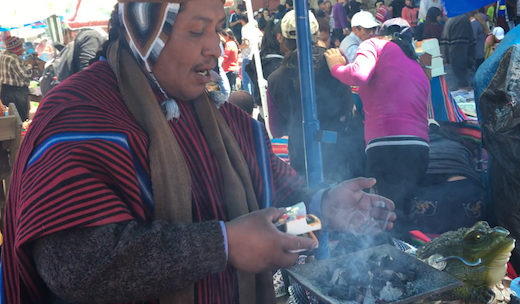 The indigenous Aymara people observed an event called Chhalasita in the pre-Columbian era, when people prayed for good crops and exchanged basic goods. Over time, it evolved to accommodate elements of Catholicism and Western acquisitiveness. Its name is the Aymara word for “buy me”. Arthur Posnansky observed that in the Tiwanaku culture, on dates near 22 December, the population used to worship their deities to ask for good luck, offering miniatures of what they wished to have or achieve. My friend saw people buying and having blessed everything from mini computers and tiny cottages to scaled down smartphones. You could even choose between different smartphone brands! Are the ancient gods of the Tiwanakuns still sprinkling their luck dust over the people of La Paz? But do Bolivians who buy and have blessed a tiny diploma work harder for their degrees? Do the people of La Paz who put an officially sanctified mini-car of their dreams on their bedside table subsequently skip a few more beers and work a few more extra hours to get the cash together? And would you be more motivated to save and invest your way to financial freedom if you wrote your goals down, collected together some images that resonated with the life you’re aiming for – whether mid-week walks in the country or a flash sports car as a go-getter – and then studied them once a week, visualizing everything, imagining how you’d feel to have achieved your goals? In every case I’d bet on it. Love it. 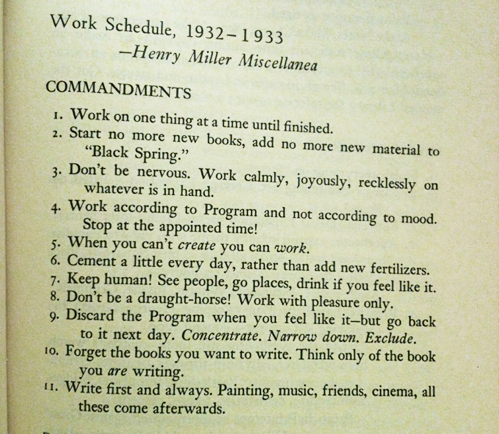 Especially the Henry Miller work schedule. I must get back to work now! Great Post. 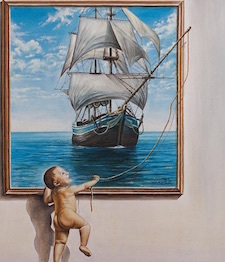 It inspired me to set myself a new goal… set up a website – http://www.shamenblessings.com. Sounds a bit Zen and the Art of Monevation – great stuff. You are certainly more organised than me with the blog posting schedules and writing quality is certainly higher. I do like setting goals but I equally like freewheeling stuff depending on how I’m feeling, and I think there is definitely something to be said about the best work getting done when you are in the zone, which can’t be planned in advance, in my experience at least. I’m not that mad about goals in the formal sense. Normal life type goals like buy a house, get married, have children, seemed more achievable and desirable to me once (how wrong I was!) So I went for them, twice in some cases (I’m still learning..) But I can see how in these life stage type goals, and possibly in business or career, one primary goal begets the next goal and so forth. Unfortunately, some of these ‘ordinary’ primary goals seem to have been snatched from the realms of possibility for many younger people starting out. Perhaps it will drive some of them to have less wishy washy goals and be even more determined and strategic. I do believe in the power of imagery though. And it’s easier to do something when you can see that others close to you have done it as it’s already been imagined for you. That thought crossed my mind reading Lord Lucan’s fascinating obituary in The Times today. Who’d have thought George Osborne’s grandmother was a dab hand at running a gentlemen’s club in London where Lord Lucan regularly gambled? No wonder he’s at ease in the treasury. It’s a major force for me, if I can imagine it, it’s possible. I think you come across as an organised person – I don’t think not buying that London property made you any less organised! Setting goals has certainly helped put me on the right path with regards to saving and investing. However, like TFS, I like ‘freewheeling’ stuff too as that’s probably when I think up new ideas. Funnily enough, my colleagues see me as organised (I set goals at work and have good time management) yet my family see me as disorganised – this might be because I haven’t achieved certain goals they deem important, ie get married, have children. I just have different priorities! What a lovely post, and a fun read! This article compounded my interest in the site. @weenie The point of having goals/targets/objectives doesn’t have to be to ensure you’re always doing something structured and mundane; it may well be that ensuring you have a reasonable amount time to spend ‘free-wheeling’ is something you prioritise. Where I personally find plans/targets/todo lists etc useful is in helping motivate myself to delay gratification. Yes I could play a game, or eat a nice meal and watch a film tonight… Or I could go for a jog, finish some DIY etc now and enjoy the benefits of those actions in future AND still have time to watch that film next week. It is really important for motivation to set goals that are not too far away. Lets say your ultimate goal is financial freedom and a net worth of a million (or 2!) Its a long journey, and its good to set major and mini goals and milestones along the way so you don’t get disheartened. It also makes you more determined to stay on track by hitting a series of specific 6 or 12 month goals rather than 10 or 20 yr goals. I’ve also noticed people who set financial goals tend to have more money and assets than those who don’t. Surely no coincidence. Our priorities can change, and it’s never too late to act upon new plans. Both of these concepts are useful to keep in mind as we save, invest, and plan for an enriching life beyond retirement. Thanks! “If you’re Mozart, Shakespeare, or Einstein then you can get by without a plan”. Seriously doubt that for the first two. Just covering the amount of paper they covered takes serious organisation, even if you just repeatedly write out the scale of C major, or the alphabet. Monevator is certainly the UK’s No1 financial blog (and I say this as a guy who has a personal finance website of his own). It’s great to hear that people take the time to email The Investor their positive feedback. That might not has been on his list of goals at the start but I bet it keeps him going. Really like the article but I must ask how you stay on track? I seem to hit no mans land and stay discplined, operating without enthusiasm and getting it done but eventually it always hits a point where I can’t be bothered or things feel very lethargic. I then end up thinking I’m on the wrong track and take time off to see if I crave what I was doing before, after about two weeks tops, self-loathing kicks in and I’m back on track. I have not been able to resolve this so I don’t have the rubbish phase followed by quitting for a short time, do you have similar experiences and if so, how do you negotiate it?